Another day, another denim. At least at the Coffee Commissary in Los Angeles. Seen above is Anthony Greenfield in a Levi’s denim jacket, Republic of Crate t-shirt, Zara jeans and his signature chapeau. Oh, and ladies and gays, if you need your daily dose of H.O.T., check out his Instagram page. Dayum. 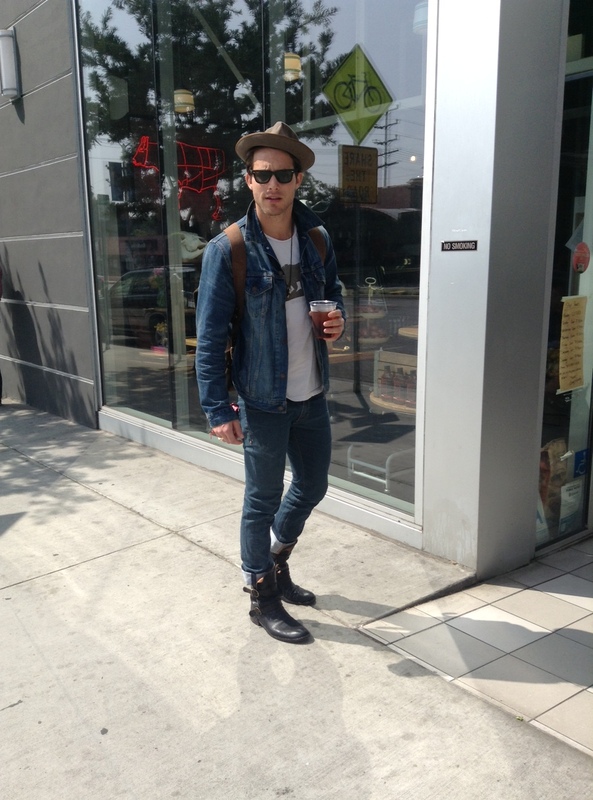 This entry was posted on Thursday, March 28th, 2013 at 12:58 pm	and tagged with Anthony Greenfield, Canadian Tuxedo, Denim, Denim on Denim, double denim, Fashion, Levi's, Los Angeles, Republic of Crate, West Hollywood, Zara and posted in In The Wild. You can follow any responses to this entry through the RSS 2.0 feed.